Back in the 1990's I was a shareholder in a small junior company and through this shareholder involvement I got to know the president, vice president and secretary treasure on a personal basis. One day I got a call from the president of this company and was asked if I would be interested in going to Guyana and maybe help manage a small dredging operation. The company at the time was in negotiations with a private group of European's who were wanting to sell a mid size alluvial placer gold property with equipment. Basically this would have been a turnkey operation. After being asked if I would be willing to go to Guyana I did quite a bit of research and became quite interested in the country of Guyana and especially gold mining in that country. The deal however never did take place as neither side could come to agreements and the company moved onto other ventures. Fast forward to today and I'm presented with an opportunity of doing a feature article with the company Guyana Goldstrike TSX-V: GYA. Guyana Goldstrike is starting to get seriously active in Guyana and not just alluvial gold mining but also potential hard rock. Before we get into the workings of the company we'll take a quick look at the country of Guyana itself. Guyana is in South America and borders between Venezuela to the west, Suriname to the east and Brazil to the south. The country covers an area of 83,000 square miles and has a population of less than one million. Guyana use to be called British Guyana as it was under British rule and today the country still follows British law and English is the official language. With no language barriers to deal with it makes it easier for foreign companies such as Guyana Goldstrike to do business. As most people live along the coastal regions, the interior areas are sparsely inhabited and largely undeveloped and for mineral exploration that means under explored potential awaits. Guyana Goldstrike as a company has a lot potential in Guyana but one of the big plus's going for it is the company's CEO, Peter Berdusco. Other people on board include the senior geologist Locke Goldsmith who is a self employed consulting mining exploration geologist. Locke has been active in geology since 1970 and has worked on projects worldwide. Marshall Mintz who is in charge of operations has over 30 years experience in mining, exploration, operations planning and operations management in Asia, Canada and South America . In prospecting circles, Guyana is very often called the "Land of Eldorado" because of the vast amounts of quanties of bauxite, manganeese, diamonds and gold along with other precious stones that are buried within the ground of this country. Historic records show that mining for gold from surface deposits began in the Amazon region as early as the 16th century. Since that time, it's estimated that over 50 million ounces of Gold have been extracted from this region as opposed to only 12 million ounces that was extracted from California during it's 1800's Gold Rush. 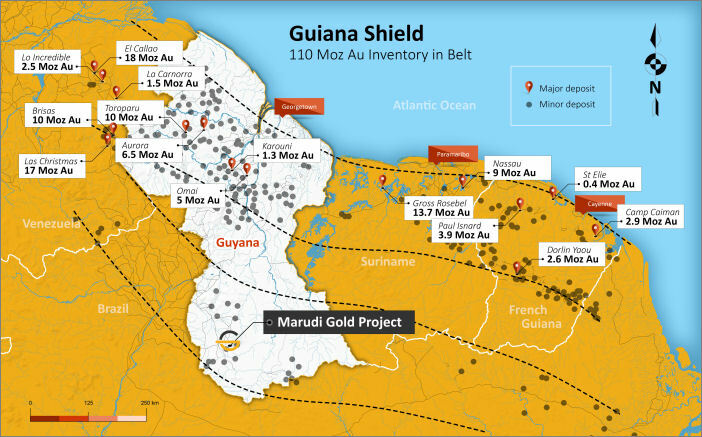 All of this gold is located in an area called the Guiana Sheild as shown in the image below. The Guiana Shield is an ancient belt of gold-bearing rock extending eastward from Venezuela through Guyana, Suriname and French Guiana and southward into Brazil's Amazon Basin, and it is historically known to contain prolific gold and diamond resources. Throughout this "shield" there are many active mining operations. Some of the more familiar larger operations are run by companies like Guyana Goldfields TSX-GUY and Sandspring Resources TSX-V: SSP. 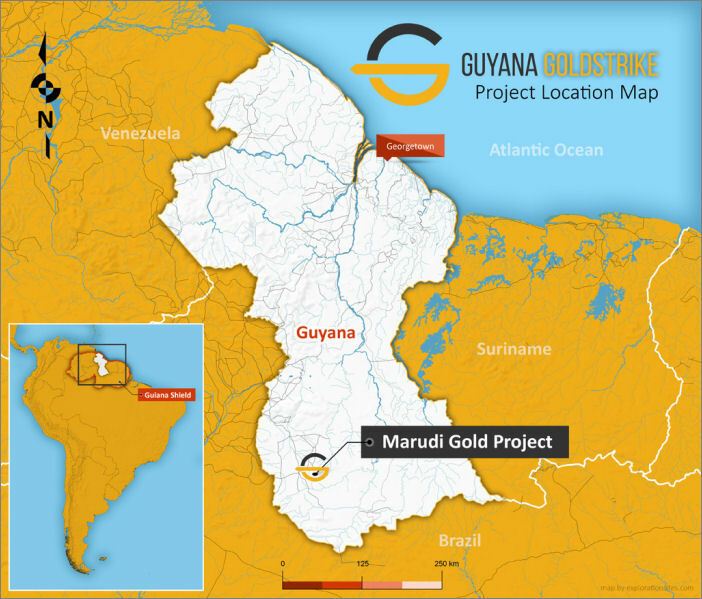 It is with the southern portion of this belt that Guyana Goldstrike has it's flagship property, the Marudi Gold Project. 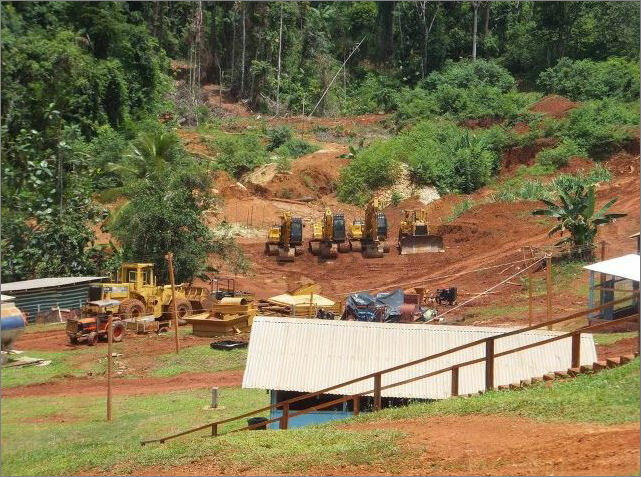 Guyana Goldstrike's main property of interest is the Marudi Gold property. This property covers an area of approximately 13,500 hectare property and is located in the southern area of the country about 750 Km from the capital of Georgetown. This property has two areas of vital interest for exploration. Both of these areas have seen past exploration including trenching and drilling so the company has a good idea of where to focus it's efforts for exploration. There is also a technical 43-101 report that drawn up in 2016 from previous workings on the property. The first area of interest is called Mazoa Hill which is a target area of approximately 300 x 300 meters. This small area has a historic 43-101 that shows about 390,000 oz gold averaging 2.8 grams per ton. One previous drill hole showed values of 14.85 grams per ton and had a 1.5 meter section with a showing of 51.7 grams per ton. Additional drilling in this area increase the resource and in 2004 a resource estimate shows an increase to 760,000 gold with a grade of 5.0 grams per ton. The second area of interest on this property is called Marudi North. This area is approxiamtely 1 KM away from the Mazoa Hill target. The Marudi North has a target area of 800 x 500 meters. Exploration back in 2004 returned a potential resource of 120,000 oz gold with a grade of 2.7 grams per ton. Additional drilling in 2012 revised that estimate by an addition 20,000 oz of gold. Between the two defined target areas there is around 880,000 oz of gold. Interest in the bedrock formation of this property is what the company is going to be examining over the 2017 work program. Under the alluvial formation of the surfaces lies what is called "Saprolite". Saprolite is soft decomposed porous rock and is often rich in clay and alluvial golds will settle out in this formation. At present there is no estimate of gold values in the saprolite layer on these properties but with grid sampling and trenching followed by additional drilling, the company plans to gain a new perspective of what this layer holds. Once this work has been completed the company will also plan on a bulk sampling program. Guyana Goldstrike obtained this property with its recent acquisition of Romanex Guyana Exploration Ltd. The previous company has an already in place and constructed camp along with other infastructure and equipment in place. During the year of 2017 the company hired the consulting firm, MineIt. What MIneIt did was take all the old drill hole data and compiled that information into a 3D model that shows exactly where the deposit on this property is and basically give an outline of the entire how large along with an estimated tonnage this deposit is. The company has since then taken this modelling and will now move forward in 2018 with additional drilling and trenching. Another unique idea that the company is exploring is the the crypto currency market and using that market to issue an ICO. ICO being "intial coin offering" like IPO being "inital public offering". Because the company has an estimated 880,000 ounce of gold it would use this gold to back the crypto coins and use the inital influx of cash to get the advanced exploration started. Today there are thousands of junior mining companies to invest in. With the recent rebound in metals and gold in particular, investor taste for these kinds of investments have turned positive. Prudent and contrairian investors know all too well that these kind of investments run in cycles. Knowing these cycles there is no doubt that the world has seen the bottom of the bear cycle and the time to look at investing in these types of investments is now. Investors who understand this will be active in evaluating companies and projects that have a lot of positives and this is a catagory that Guyana Goldstrike is in. Here is some good reasons to have Guyana Goldstrike on your investing radar. To find out more about and these projects, Click Here to visit their website. There you will find all an exstensive amount of information along with contact information. Want To Be A Featured Miner? For previous featured juniors just click here.